Tritons Treasure Video Slot Guide & Review - Casino Answers! Triton’s Treasure is a 5-reel, 25-line video slot developed by Realtime Gaming, featuring an expanding wild symbol, scatter wins, a free spins feature and two progressive jackpots. You can play the Triton’s Treasure Real-Series Video Slot at USA-friendly casinos Cherry Red Casino and Club USA Casino. Bets on the Triton’s Treasure slot machine are $0.01, $0.02, $0.03, $0.04, $0.05, $0.06, $0.07, $0.08, $0.09, $0.10, $0.25, $0.50, $1, $2.50 and $5 per line. You can select from 1-25 paylines on a spin. You can play as little as a penny per spin up to the maximum total bet of $125 per spin. The betting range is extensive enough for low, medium and high stakes players. To manually skill stop the reels, you can hit the “Stop” button in the middle of any spin. To play the Triton’s Treasure online slot, press the “Spin” button. The King Triton symbol is the wild symbol on the Triton’s Treasure video slot. The symbol only appears on reels 2, 3 and 4 and substitutes for all other symbols except for the Scattered Mermaid symbol. Whenever the King Triton wild symbol appears, he will become an expanding wild and cover the entire reel he appears on. The King Triton symbol does not pay out by itself. Triton’s Palace is the highest paying symbol on the Triton’s Treasure slot game. If you hit 5 Palace symbols, you will win the 3333 coin top jackpot. The Sunken Ship symbol is the second highest paying symbol on the Triton’s Treasure video slot, paying up to 2222 coins. You can bring Triton’s Treasure home by hitting these symbols when you play for real money at Cherry Red Casino! The Mermaid is the scatter symbol on Triton’s Treasure. 2, 3, 4 or 5 Scattered Mermaid symbols will pay out 1X, 2X, 10X or 100X your total bet. When 3 or more Scattered Mermaids appear anywhere on the reels, you will win 5 free spins with a 1X initial multiplier. You will receive 1 bonus pick for each Mermaid symbol that lands on the reels. With each pick you receive, you can win 5 additional free spins or to increase the multiplier by 2. If 3 or more scatter symbols occur during the free spins feature, you will receive 5 additional free spins. Free spins are played at the lines and bet of the triggering game. Triton’s Treasure has two progressive jackpots called the Minor Jackpot and Major Jackpot. At the time of this writing, the Minor Jackpot is at $309 and the Major Jackpot is currently set at $1,871. The progressive jackpots are randomly triggered and can be won at the conclusion of any spin you make on Triton’s Treasure. Progressive Jackpot wins are added to other wins. Random Jackpot contribution is no more than 1.5% of total Return to Player. Hit the “Autoplay” button to open the autoplay settings. You will be able to set the number of spins, set it to stop when the jackpot is won, stop if a win exceeds or equals (any amount you input), stop on any win, stop if your balance increases/decreases by any amount you input and stop once the feature is triggered. You can stop the Triton’s Treasure autoplay mode using the “Stop Auto” button to deactivate it. Turbo Play can be found in the autoplay settings if you’d like to speed up the gameplay. Triton’s Treasure offers some good top payouts in addition to the expanding wild symbol that is sure to win you some cash when you play Triton’s Treasure. If you’re looking for a good merman or mermaid slot, you can play the Triton’s Treasure video slot when you sign up and make a first deposit today at Cherry Red Casino! 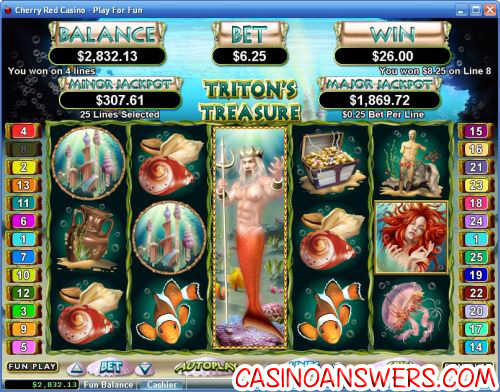 Can USA players play the Triton’s Treasure online slot for real money? Players who are based in the United States of America can play the Triton’s Treasure slot machine at their choice of either Cherry Red Casino and Club USA Casino. For more details on Cherry Red Casino, please read our Cherry Red Casino Review. Can I play a free Flash game of the Triton’s Treasure slot? Unfortunately, Triton’s Treasure is not offered at Cherry Red Flash Casino and Club USA Flash Casino. 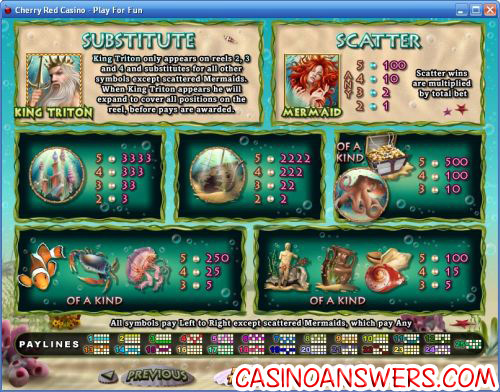 However, you can play a Flash game of the more non-fantasy underwater video slot called Crystal Waters. How do I trigger the Triton’s Treasure progressive jackpots? You can win the progressive jackpots on the Triton’s Treasure simply by playing. Both of the jackpots can be won on any spin and all you have to do it play to win them. If you’re looking to increase your chances of winning, we suggest increasing your bet per line. Try to win the Triton’s Treasure progressive jackpots at Cherry Red Casino. Where can I play the flash version of Tritons Treasure?